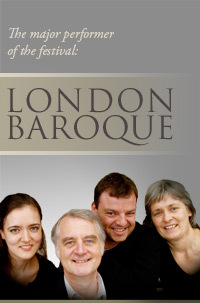 Formed in 1978, London Baroque has belonged to the leading exponents of early music for thirty years. Their high-standard, supple and flexible, wonderfully lively playing, the perfection of technique and virtuosity make them one of the most appreciated performers of baroque chamber music. 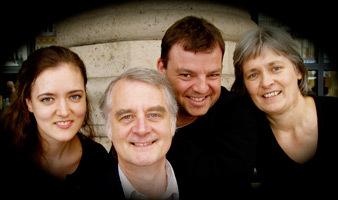 The string quartet, occasionally extended by a harpsichord-organ player, has performed in most of the major European festivals, appeared frequently on TV and radio the world over, and tour regularly in Japan and the USA. Their repertoire spans a period from the end of the sixteenth century up to Mozart and Haydn. They often give concerts with Emma Kirkby, one of the best known sopranos and most outstanding early music performers of the world. Recording mostly for Harmonia Mundi and BIS, their releases have received great critical acclaim and are considered exemplary. A critic of Goldberg magazine wrote about their disc with Emma Kirkby of Händel sacred cantatas: “They have never made a better disc and neither have I heard a superior performance of any Händel trio sonata.” Their release of Vivaldi trio sonatas was given the following appreciation by a Gramophone reviewer: “London Baroque bring their customary virtues to these performances, including excellent internal rapport and blend, a richly mined string tone, passion and intensity”. In the 2008/2009 season London Baroque is going to perform their repertoire ranging from early English music to Mozart and contemporaries in a lot of European countries and also in Canada, Korea, Singapore and Abu Dhabi. They are coming to Börzsöny Baroque Days festival with a programme of the great English baroque composers John Jenkins and William Boyce as well as works by Couperin, Händel, Johann Sebastian and Johann Christian Bach.